-- Select a Size/Color -- 6"-10" 10"-16" - Out of Stock! 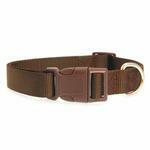 14"-20" 18"-26"
Add some richness to your dog's day with the Zack & Zoey Nylon Dog Collar in Chocolate! Our Zack & Zoey Nylon Dog Collars are durable and fashionable basics but this Chocolate color is anything but plain! This lovely shade of brown is a rich neutral tone that will complement your pet's natural good looks. This rich chocolatey shade won't clash with your pet's other fashions and is a great choice for both male and female dogs. This brown color is a great choice for supporting sports teams that feature brown such as the Cleveland Browns. 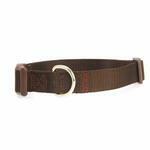 We love this brown dog collar year-round, but we especially find it appropriate in the fall and around Thanksgiving. Nylon Dog Collar by Zack & Zoey - Chocolate Customer Photos - Send us your photo! Angus Beefsteak is quite the attention seeker. He is our newest puppy child and loves making us laugh. Here he is showing off his pretty Zack and Zoey Collar! "i love cuddling in Mommys big bed in my comfy Christmas jammies!" Posted On 02/19/19 by J.A. G from Chicago , IL Yes, J.A. G recommends this product! Color match of plastic hardware 2 nylon is great. Posted On 01/14/19 by Michelle B from Huntsville , AR Yes, Michelle B recommends this product! Love these Zack and Zoey collars, just wish they were more in stock. Posted On 12/01/18 by Susan G from West Lawn, PA Yes, Susan G recommends this product! This basic brown collar looks nice with my beige/cream pup's fur and fits well. Posted On 03/12/18 by connie b from Waynesboro, VA Yes, connie b recommends this product! Very nice collar-well made and a beautiful color. This really looks good with my little Rue's big brown eyes!! Thanks Baxter Boo! Posted On 12/21/16 by Mel from , CA Yes, Mel recommends this product! Posted On 06/14/16 by Lisa W from Chico, CA Yes, Lisa W recommends this product! I looked far and wide for a small brown collar. Thankfully you had one and it was resonably priced. Posted On 01/28/15 by Todd F from hawley, PA Yes, Todd F recommends this product! I am delighted with selection and prices. Great web site and quick!